In Sierra Leone, the diet of pregnant and lactating women and that of children 6 to 23 months old (1,000-days households) are deficient in animal-source foods. This is thought to be a contributor to the very high rates of stunting among children in rural Tonkolili District. Smoked and raw marine fish is commonly consumed by rural families, providing a key source of nutrients. Results from a formative research assessment using Barrier Analysis showed, however, that mothers often shy away from the purchase of fish due to hygiene issues evident in the market place as they do not want toutilise poor quality fish in complementary foods for their babies. At the same time, SPRING also conducted an adapted value chain analysis of the fish value chain to identify ways to improve the profitability of supplying and selling fish and to improve access to and affordability of hygienic fish on the part of 1,000-days households. The value chain analysis concluded that the quickest way to improvehygiene of fish to be consumed by small children was for individual market sellers to improve the hygienic conditions of their fish stalls. This also could provide an incentive to the fish sellers by making their products more attractive to customers and increasing sales. 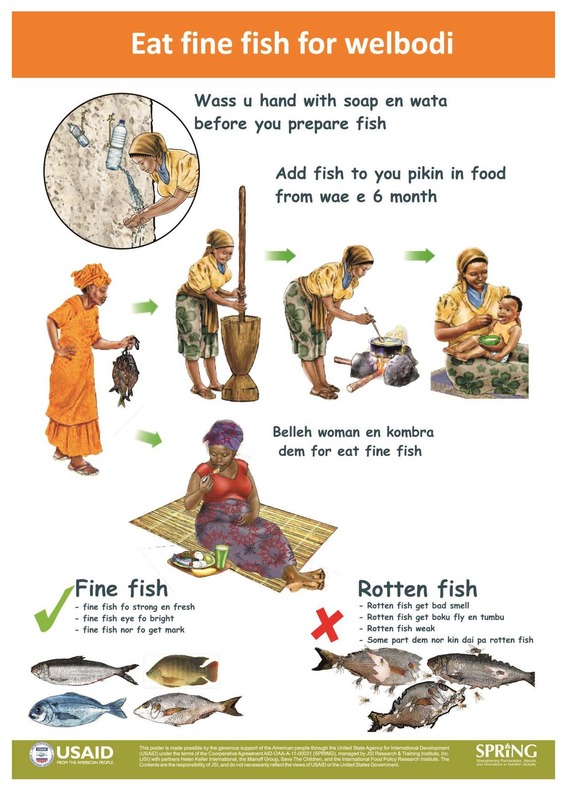 SPRING then worked with our local partner Helen Keller International/Sierra Leone to develop a poster for use in local markets to promote good hygiene among fish sellers. This effort was accompanied by the development and dissemination of maternal, infant, and young child nutrition counselling cards that include messages for mothers on how to identify a “hygienic” fish seller and purchase “clean” fish for their babies. The poster was pretested in rural communities and finalized for use in local markets to promote the supply of hygienic fish while HKI and the Ministry of Health are actively promoting the purchase of hygienic fish and its consumption within 1000-days households.